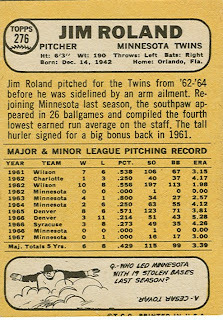 Jim Roland (#276) had cards from 1963-1965, but missed out in 1966 and 1967. Here he resurfaces to begin a string of 5 seasons on a baseball card. 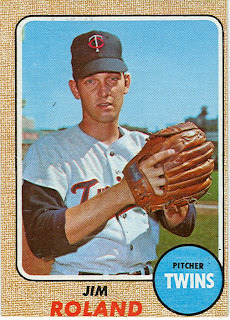 Jim was signed by the Twins in 1961, and spent only 2 seasons in the minors before making his major-league debut in September 1962. He spent the following 2 seasons with the Twins. 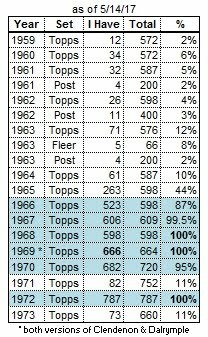 Being a swingman, Baseball-Reference.com doesn't list him as being among the team's top 10 pitchers, but in 1963 he was 9th in innings pitched (49), and in 1964 he was 6th in innings pitched (94). 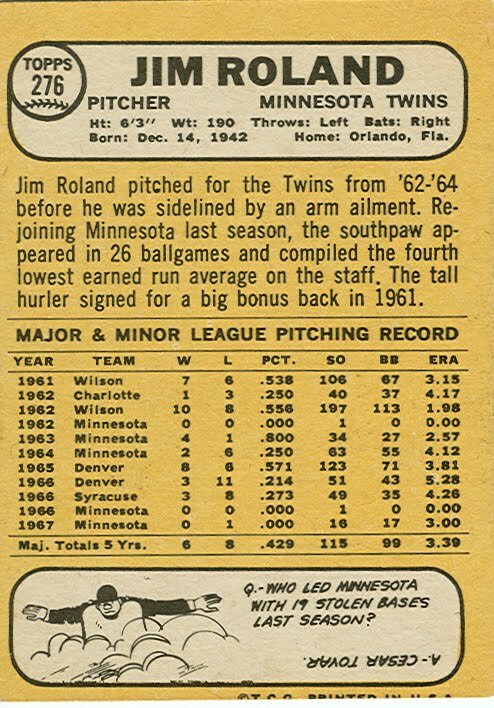 Roland spent the entire 1965 and 1966 seasons in the minors, rehabbing from arm injuries. He pitched about 30 games each season, mostly as a starter. 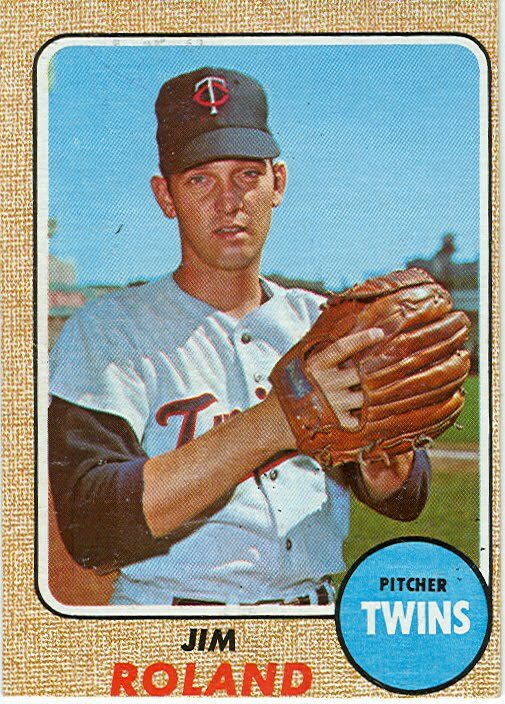 Jim returned to the Twins in 1967, and took his place alongside all the other Jims on the Twins' pitching staff. 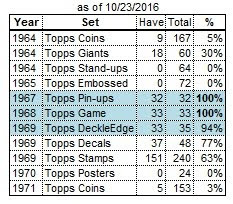 In 1967, he appeared in 25 games (all in relief) with 35 innings pitched. (I guess he was the "situational lefty".) The following season he made 4 starts and relieved in 24 games, but he was no longer the senior southpaw in the bullpen, as Ron Perranoski had been acquired from the Dodgers in the off-season. In February 1969, Roland was sold to the Athletics, where he joined rookie Rollie Fingers and veterans Lew Krausse and Paul Lindblad in Oakland's bullpen. After 3 seasons with the A's, Jim was sold to the Yankees in April 1972. At the end of August, the Yanks traded him to the Rangers for pitcher Casey Cox. With Texas, Roland pitched 5 games (a total of 3.1 innings), and fashioned an 8.10 ERA. That was enough to call it a career after the season. Jim Roland died at age 67 on March 6, 2010 in Shelby, North Carolina, about 90 miles from his birthplace of Franklin, NC.